DISCOVHAIR™ LABS’ UNIQUE CARE SHAMPOO FORMULA CONTAINS A WINNING COMBINATION OF NATURAL INGREDIENTS INCLUDING NUTRIENTS, MOISTURISERS, MICROCAPSULE KERATIN, AMINO ACIDS AND PROTEINS THAT ENHANCE STRUCTURE AND VITALITY WHILE MAINTAINING A NATURAL SHINY LOOK. AMINO CARE SHAMPOO IS NATURAL, CONTAINS NO-SALT, IS PARABEN FREE AND IS HIGHLY RECOMMENDED AND SAFE FOR ALL TYPES OF HAIR. 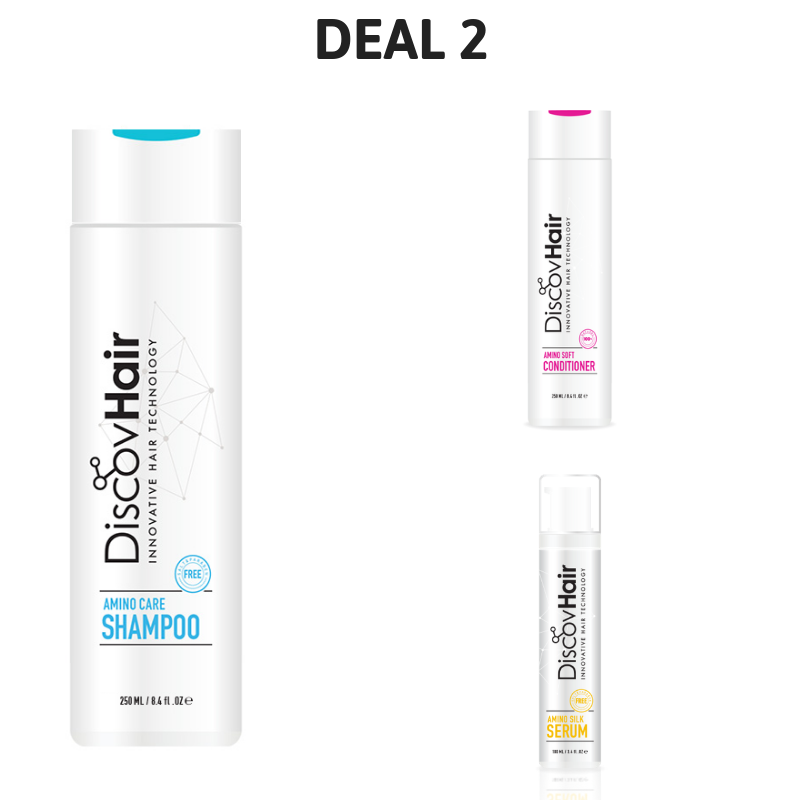 DISCOVHAIR™ LABS HAVE DEVELOPED THE IDEAL AMINO SOFT CONDITIONER TO TRANSFORM DRY, FRIZZY, DAMAGED AND DEFIANT HAIR INTO SOFT, SMOOTH AND HEALTHY HAIR. THE FORMULA PROTECTS AND RESTORES VOLUME, STRENGTH AND LUSTRE FOR A LASTING HAIR EXPERIENCE. IT CONTAINS A WINNING COMBINATION OF NATURAL INGREDIENTS INCLUDING SOFTENERS, NUTRIMENTS, MICROCAPSULE KERATIN, AMINO ACIDS AND PROTEINS. THESE ENHANCE STRUCTURE AND VITALITY WHILE MAINTAINING A NATURAL SHINY LOOK. AMINO SOFT NATURAL, NO-SALT, PARABEN FREE CONDITIONER IS HIGHLY RECOMMENDED AND SAFE FOR ALL TYPES OF HAIR. DISCOVHAIR™ LABS SET THE NEXT-LEVEL IN HAIR CARE BY PROVIDING SOLUTIONS FOR HAIR UNDER STRESSED CONDITIONS. AMINO SILK SERUM ENHANCES HAIR SYMBIOSIS WITH VARIOUS ENVIRONMENTS, PROTECTS HAIR FROM SUN AND HUMIDITY LEAVING HAIR SMOOTH, SLEEK AND DEEPLY MOISTURISED FOR HOURS. AMINO SILK NON-GREASY SERUM CONTAINS NUTRIENTS, MOISTURISERS, MICROCAPSULE KERATIN, AMINO ACIDS AND PROTEINS THAT MAINTAIN A NATURALLY SLEEK LOOK ADDING VITALITY AND SHINE TO YOUR HAIR. AMINO SILK SERUM NATURAL, NO-SALT PARABEN-FREE SERUM IS HIGHLY RECOMMENDED AND SAFE FOR ALL TYPES OF HAIR.